I’m not big on resolutions. It’s no secret that Cornish Rock Pools HQ is powered by chocolate and would crumble without it. This year I do have one resolution though. It’s something I do already, but I know I can do more. This year I’m going to cut down on plastics. (Thankfully I can still buy chocolate that isn’t wrapped in plastic). I’m going to be ruthless in my avoidance of plastic bags, bottles and excess packaging. I’m not going to be embarrassed to hand back the plastic bag I didn’t ask for in the shops. I’ll be getting out there doing beach cleans – always leaving a beach cleaner than I found it. I’m also going to step up my involvement in campaigns to reduce plastics because there’s a limit to how much we can do without policy changes. 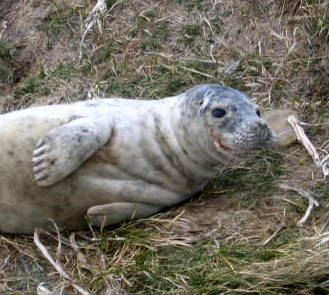 Let’s make the seas safer for seal pups like this one. There’s no such thing as throwing plastic away – there is no away with plastic. Even if it breaks down, you simply end up with smaller pieces of plastic in the environment, tiny pieces which are highly dangerous to wildlife. The deepest, remotest stretches of seabed are now contaminated with plastic – plastic that carries toxins; plastic that animals mistakenly consume, plastic that kills marine life. There is a great tide of plastic flowing into our oceans and landscapes and we have to find ways to stem and reverse it. 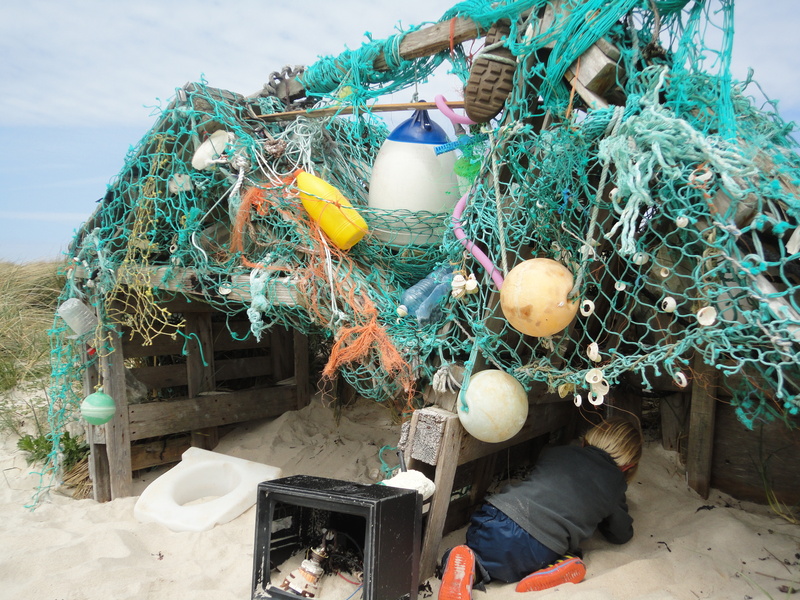 Shelter Made from Marine Litter (Isles of Scilly). So that’s my New Year’s resolution. I hope all of you wonderful people who love our Cornish rock pools and wildlife will join me. We can make a difference with our choices and our voices. If you’re up for the challenge, here are things you can do… even if you just do a few it all adds up. Avoid microplastics – tiny plastic beads in cosmetic scrubs, etc. Take the pledge here to put pressure on beauty product manufacturers to stop using plastics in this way. Join the campaign to avoid free plastic bags and make the new 2015 5p charge in England apply to all one-use bags, not just large businesses. If you have other ideas and suggestions, please do share them on Cornish Rock Pools’ Facebook page. I also agree that plastic isn’t so fantastic, especially given the way us humans utilise it and discard it without a thought for the wider environment and its creatures. I must say like you, naturestimeline cannot operate, not without chocolate (only just) but without copious amounts of caffeine each day. It sounds like naturestimeline and Cornish Rock Pools have a lot in common. Small changes can make a big difference if lots of people are involved. There’s lots to do this year – definitely not the moment for us to give up our respective energy sources!